The Photography department welcomes TC Colley lecturer Alejandro Cartagena. Born in the Dominican Republic in 1977, Cartegena employs landscape and portraiture as a means to examine social, urban and environmental issues. Rooted in the formalistic style of documentary photography, he critically examines Mexico’s drive towards economic development while contrasting a yearning for a fairer world in which to live. 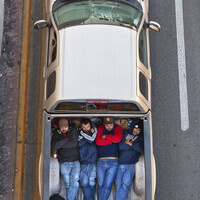 His 2014 series Car Poolers, which featured a bird's-eye view of workers commuting in the beds of pickup trucks, received widespread critical acclaim and was featured in The New York Times and other international publications. Archival and found pictures form the basis for his latest body of work, which explores "invisible," vulnerable people who are displaced in the midst of current political vitriol.